The Middlesex County town of East Hampton sits on the Connecticut River’s eastern bank and includes one of the state’s largest inland bodies of water, Lake Pocotopaug. First called Chatham, the town incorporated in 1767. Like its namesake in England, the town’s early economy relied on shipbuilding and associated industries, such as rope and sail making. In the 1800s, it became known as “Belltown, USA” as Bevin Brothers Manufacturing Company (which still operates in town) and others made bells for sleighs, farm animals, and other uses. 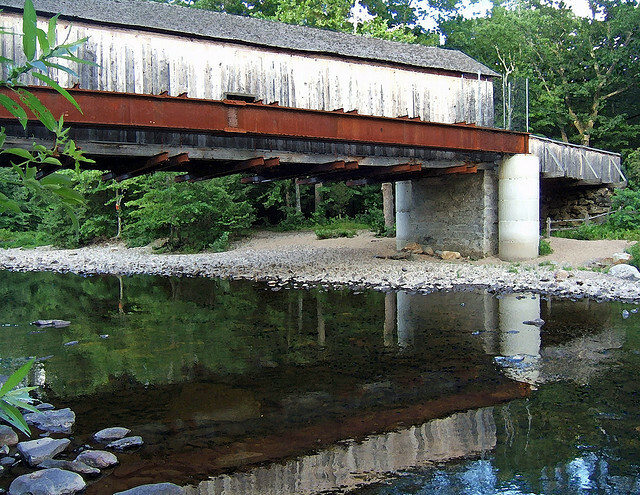 Renamed East Hampton in 1915, the town today is home to the Comstock Covered Bridge and Middle Haddam Historic District, which features structures from the Colonial, Federal, and later periods. “Hurd State Park.” Department of Energy & Environmental Protection, 2017. Link. “The Chatham Historical Society,” 2017. Link. “Digitized Historic Newspapers - Various Titles & Dates.” East Hampton Public Library, 2017. Link. “East Hampton - WPA Architectural Survey.” Connecticut State Library Digital Collections, 2017. Link. O.H. Bailey & Company. “East Hampton, Connecticut.” Bird’s-eye. Boston, MA: O.H. Bailey & Company, 1880. Connecticut History Online. Link. Bevin, Abner A. Patent Number 215,559 - Sleigh-Bell Strap. 215,559. East Hampton, issued May 20, 1879. Link. Bevin, Abner A. Patent Number 262,358 - Team Bell. 262,358. East Hampton, issued August 8, 1882. Link. Bevin, A. G. Patent Number 90,811 - Improved Bell. 90,811. East Hampton, CT, issued June 1, 1869. Link. “Photograph: Bevin Brothers, East Hampton,” ca 1900. Connecticut History Illustrated, Connecticut Historical Society. Link. Connecticut State Historic Preservation Office, and Greater Middletown Preservation Trust. Historic and Architectural Resource Survey of Middle Haddam, Connecticut: Town of East Hampton. Hartford, CT: State Historic Preservation Office Connecticut Commission on Arts Tourism Culture History and Film, 2003. Greater Middletown Preservation Trust, and Lucy Potter. The History and Architecture of East Hampton. Middletown, CT: Greater Middletown Preservation Trust, 1980.